Bacon Wrapped Scallops! 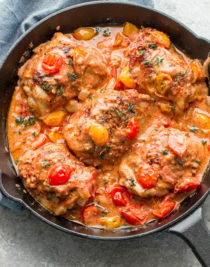 One little bite of deliciousness wrapped in bacon, which is crispy on the outside and soft and tender on the inside, topped off with a warm creamy sauce. Perfect for any party. Bacon wrapped around anything has so much good taste and flavor. It just gives that something extra to a meal. 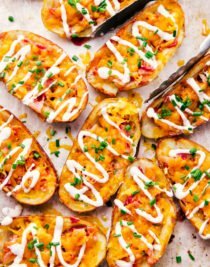 If you are a fan of bacon like I am you should definitely try one or all of these recipes too, Bacon Wrapped Chicken with Jalapeno Cream Sauce, Honey Garlic Bacon Wrapped Chicken Kabobs or Maple Glazed Bacon Wrapped Little Smokies. If you want to know something about my family and I, we love Bacon Wrapped recipes. My daughter, who is only 2 is a bacon fanatic, so these Bacon Wrapped Scallops were a huge hit. Although she likens everything to chicken, and could tell there was something a little different when eating the scallop she still loved it. I know wrapping bacon around food can sometimes be a little frustrating, but just do it. 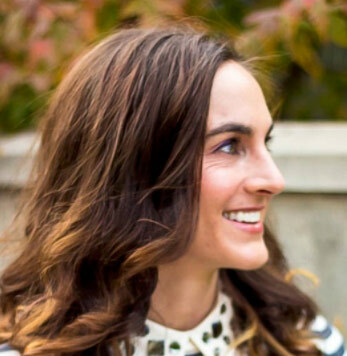 If it pulls away a bit from your food that is ok, it will still taste sensational. 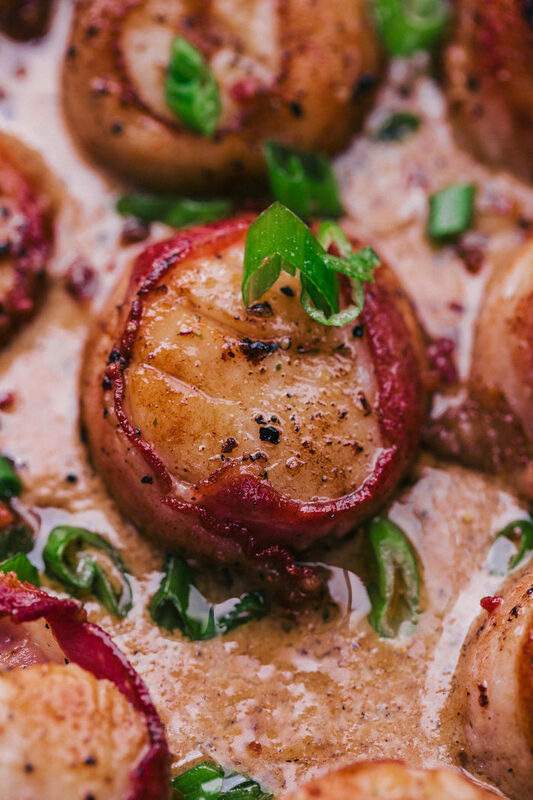 These Bacon Wrapped Scallops have the delicious bonus of a creamy sauce that also is infused with bacon. A win, win! How long does it take to cook bacon wrapped scallops? I like to cook these scallops in a heavy skillet, so once they are all wrapped in bacon and secured with a toothpick (optional), heat a skillet over medium high heat and add olive oil. Make sure to season your scallops with garlic salt and pepper and cook about 4 minutes a side or until bacon has browned and is crisp. 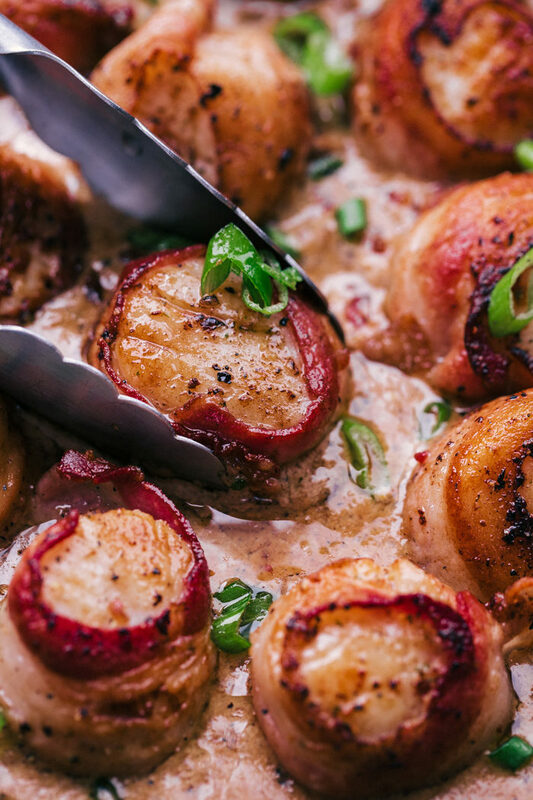 How do you cook scallops wrapped in bacon? You can cook scallops several different ways. I choose to cook these bacon wrapped scallops on the stove in a skillet. You can also cook them on the grill, season with garlic salt and pepper and make sure to put them on a piece of foil sprayed with cooking spray so the grease from the bacon doesn’t cause your scallops to catch on fire. 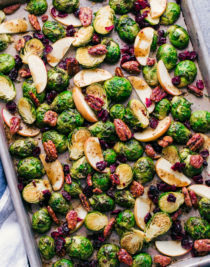 The oven is a third option and you can put them under the broiler for 10-15 minutes. Broil until the bacon is cooked through, making sure to turn them halfway through cooking. Rinse your scallops and pat them dry with a paper towel. Liberally season the scallops with garlic salt, pepper, and old bay seasoning. Using regular cut bacon, cut each piece in half and wrap one half around each scallop, securing with a toothpick (optional). Heat a large skillet over medium high heat and pour 3 Tablespoons of olive oil in. Once you see the oil begin to smoke place in your bacon wrapped scallops. Cook for 3-4 minutes and flip. Cook an additional 3-4 minutes until bacon is cooked through and the edges are crisp. 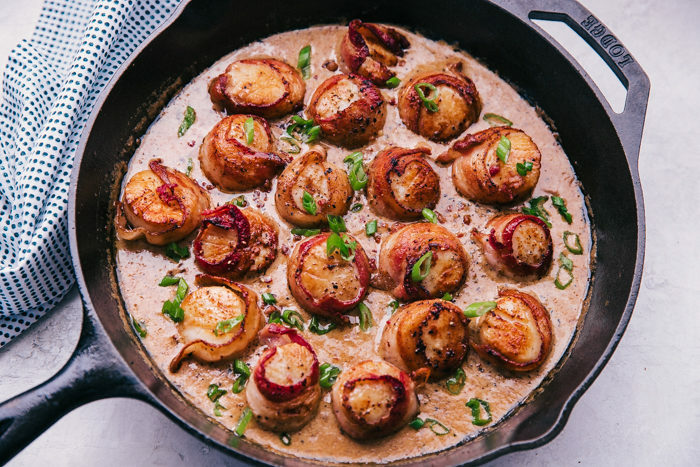 How do I make cream sauce for bacon wrapped scallops? In the same skillet you used to cook the scallops, cook 5 pieces of chopped bacon until crisp. Remove bacon with slotted spoon and set aside. 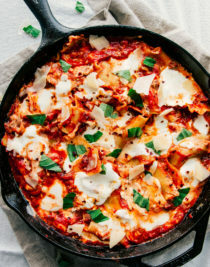 In the same skillet with the bacon drippings add butter, milk, minced garlic, and parmesan cheese, whisk together and allow to come to a slow boil then reduce heat until slightly thickens. Add the Scallops back into the skillet and using a spoon pour some of the cream sauce over the scallops. Garnish with diced green onions. 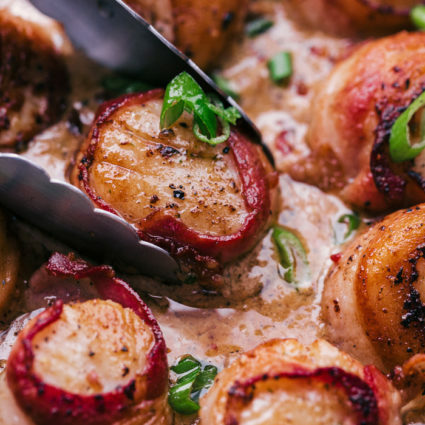 Bacon Wrapped Scallops are the perfect appetizer for any party or get together. Impress your family and friends with this sensational skillet of creamy bacon goodness. 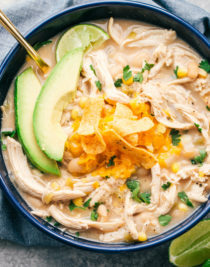 Cooking doesn’t have to be difficult, but it should always be delicious. Rinse and dry scallops with a paper towel. Season all sides with garlic salt, pepper, and old bay seasoning. Using 10 pieces of bacon, cut the bacon in half and wrap each scallop around the outside securing with a toothpick (optional). Heat a skillet to medium high heat and add olive oil. Allow the olive oil to warm up for a minute and then add in scallops. Cook for 4 minutes and then flip, cooking an additional 4 minutes. Making sure the bacon is cooked through. Remove from skillet and set aside. In same skillet cook chopped bacon, remove and set aside. Add butter, garlic, cream and old bay seasoning. Whisk to combine. Add in parmesan cheese and let come to a light boil. Reduce heat add in cooked chopped bacon and simmer until slightly thickened, about 2-3 minutes. Add the scallops back, cook for about 2 minutes so scallops get warm and spoon some of the sauce over the top. 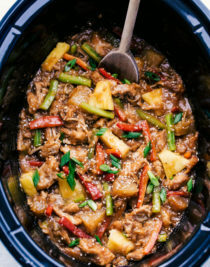 Garnish with diced green onions and serve. You can cook them 2 minutes each side, but the bacon won’t be cooked and the bacon also protects the scallops from over cooking. 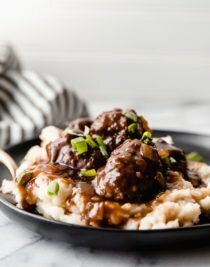 Does anyone have the nutrient values for this recipe, especially protein? 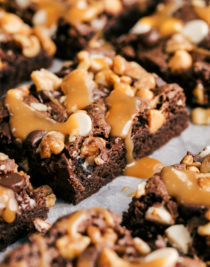 I updated the recipe with all the nutritional stats. I hope this helps.